With steep narrow walls and tricky, high-contrast lighting, canyons are notoriously difficult to photograph. 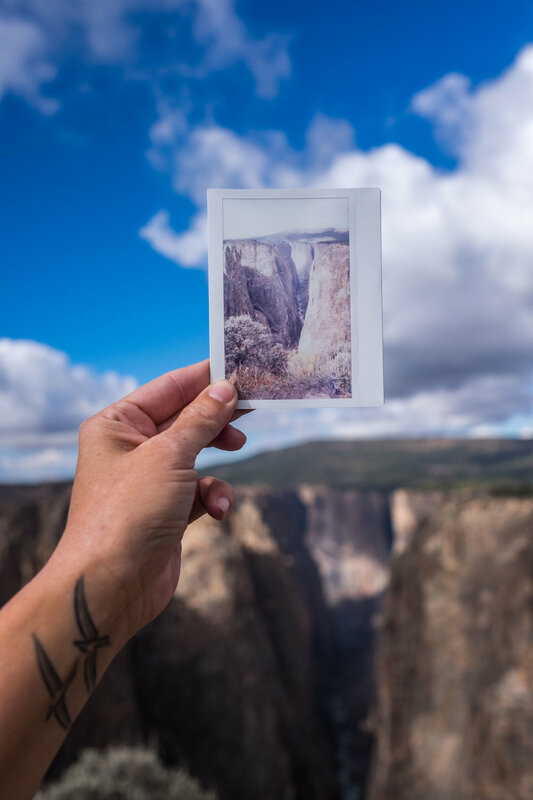 Whether it is the Grand Canyon or a narrow slot chasm, most people get frustrated trying to walk away with a great picture while visiting a canyon. 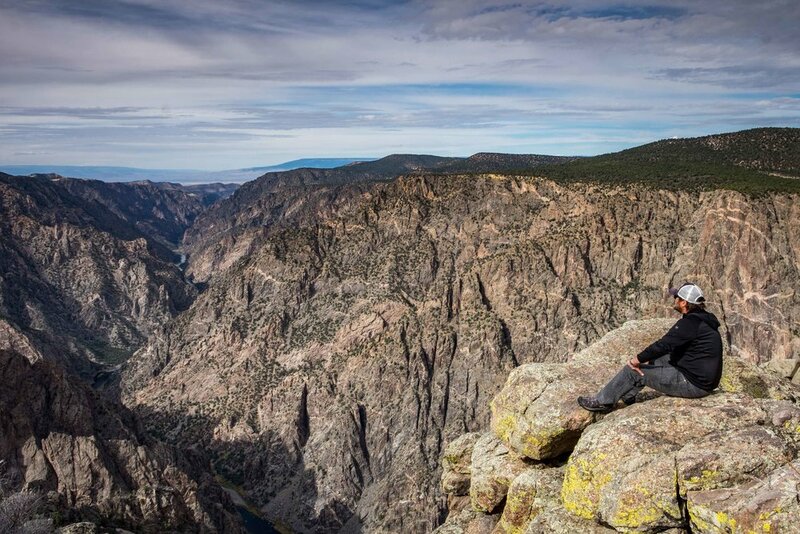 Black Canyon of the Gunnison is no exception. 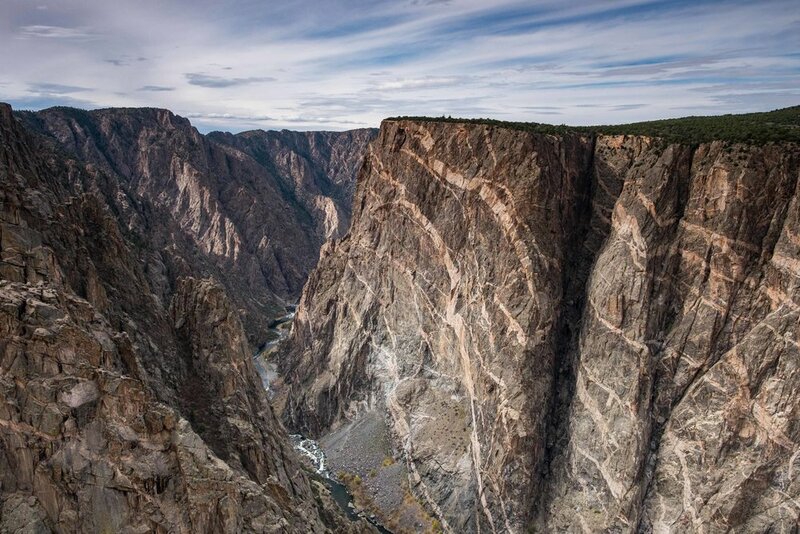 In fact, it is one of the deepest, narrowest, and steepest canyons in North America, making it much more difficult to capture than its larger, more open counterparts. 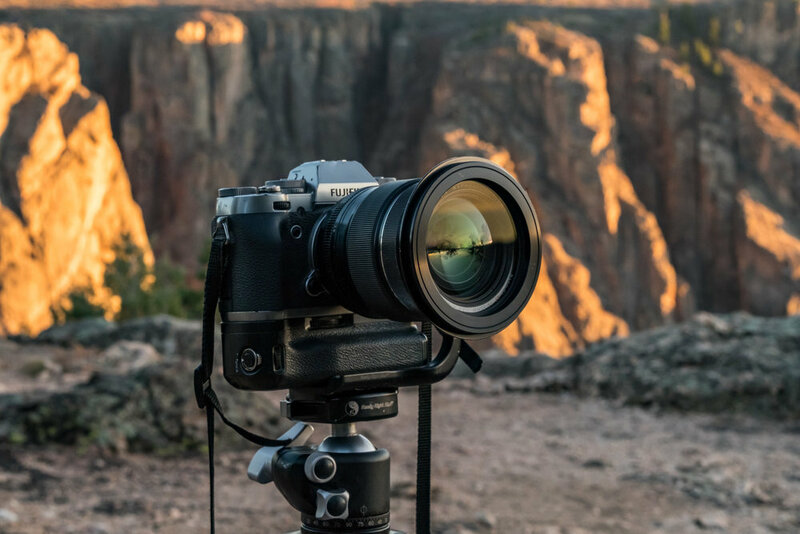 Here are some tips to help improve your chances of getting a money shot the next time this challenging subject is focused on the other side of your lens. Taking time to scout locations is a time-tested method for getting great shots, no matter the locale. It’s something I try do for every location in which I shoot. Even when I am driving or hiking I am still always in “scout” mode. Most of the time I scout when the light is not great for shooting (usually midday). But for canyon photography you might find that mid-mornings or mid-afternoons, when there is harsh side light illuminating only a portion of the inner canyon, are better times for scouting. Find great places where you can envision great shots, and take note of how the lighting at different times of the day will affect the shot, and you are one step closer to capturing a great shot when better lighting appears. I firmly believe that you should always try to get the best exposure in-camera. But let’s be realistic, we all sometimes over/under expose. Plus, canyons are places of high contrast where it can be very bright on the surface, but near pitch black in the canyon. Shooting RAW (uncompressed, original files) will allow you the widest latitude when it comes to recovering shadows and/or highlights in post-production. If you do nothing else on this list, don’t skip this one. Always shoot RAW. Bracketing images means taking several images (usually three to five) of the same scene at different exposures (+ and – a normal exposure) to capture the entire dynamic range of a high contrast scene. 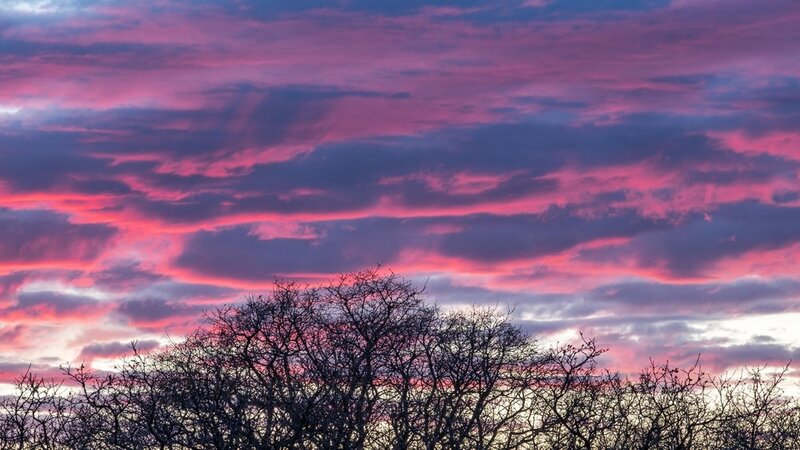 These images can then be stitched together in post-production into an HDR (high dynamic range) image. Now, I know HDR has a bad reputation, mostly because of the heavy use of Photoshop tools which result in unrealistic looking images. 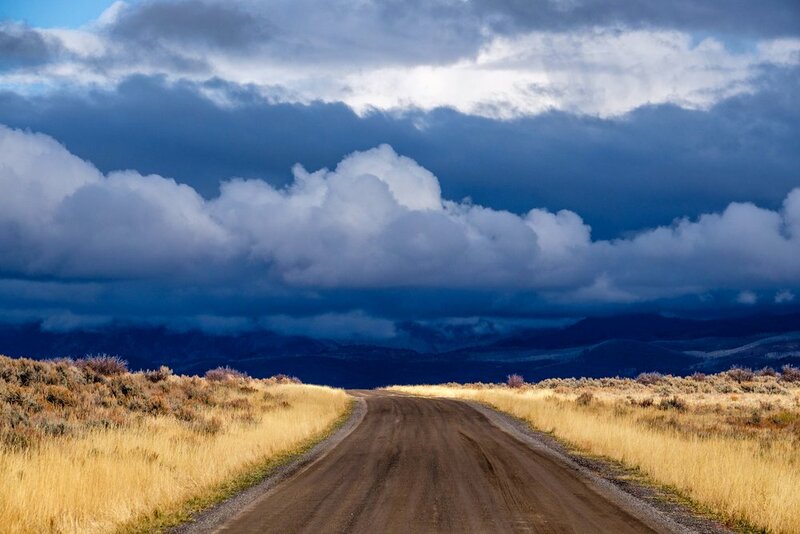 But at its core, HDR images are simply meant to show the entire dynamic range of light and shadow when your camera is not able to capture it in a single exposure. This inability to capture the entire range in a single exposure – where the light at the surface is very bright but the shadows in the canyon are far darker – happens a lot in canyons. Either you will lose highlight detail (and blowout the sky) or shadow detail (unrecoverable shadow detail) when the range of contrast is greater than what the camera can handle. Many cameras today even have a built in HDR mode, which can be helpful for those new to bracketing images and stitching into HDR. So set up your tripod, shoot three or more bracketed images, use a soft touch in post-production, and you will get a nice image result from a tricky lighting situation. As is often the case in canyon photography, sometimes it’s important to balance the strong light with the dark shadows in a scene. In this case, a Graduated Neutral Density filter can help a lot. A GND filter sits on the front of your lens and has a gradual reduction in light from one end to the other. If you tone down the harsh sunlight at the top of the canyon (with the dark side of the filter), and leave the inner canyon alone (with the clear side), you will get a more balanced image, thereby helping your camera to retain detail in all areas. GND Filters come in all shapes, sizes, and variances, but my favorite is the Lee Filters 100 x 150mm 0.9 Soft-Edge Graduated Neutral Density Filter. How you go about photographing canyons can often be anathema to how we usually photograph. We are told to look for the beautiful days filled with the soft and warm glow of the golden hour light. However, bright and sunny days and strong side lighting can make it difficult to photograph canyons well, as the light has a hard time reaching the inner canyon walls in a pleasing way. Instead, I look for cloudy days – which not only bring a nice moody feel to the photo, but also act as a diffuser for the sun – thereby eliminating strong contrast scenes. I also go out and photograph midday when the sun is high in the air, which is usually a no-no for photography, but for canyons, midday is one of the only times when the entire canyon can be lit by even light. So don’t be afraid of cloudy, overcast days or midday shooting – they are often your best choice for photographing canyons. 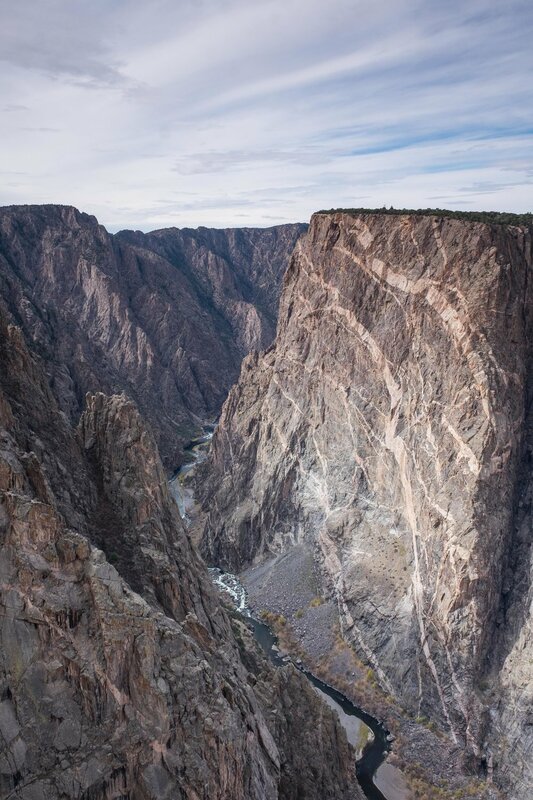 I don’t love heights, and Black Canyon of the Gunnison has some of the steepest and sheerest cliff faces in North America which can be seen from almost every lookout in this national park. And there’s really only one way to show the depth and scale of the canyon and that is to get out close to the edge. For some of you, this may not be a big deal; for others, this is might be your greatest fear. Sometimes you must push yourself a bit to get better shots. 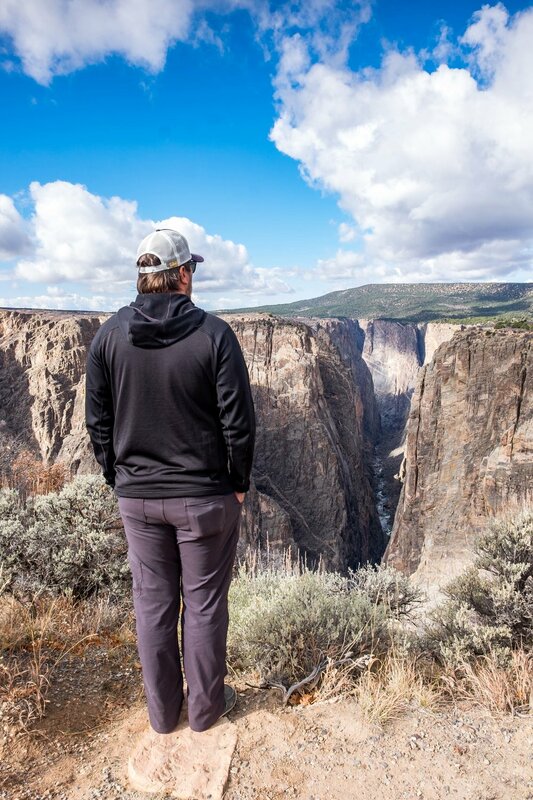 Trust me, I didn’t love looking down on what would’ve been certain death had I toppled over, but my desire to represent this national park in the best way possible far supersedes my fear of heights. 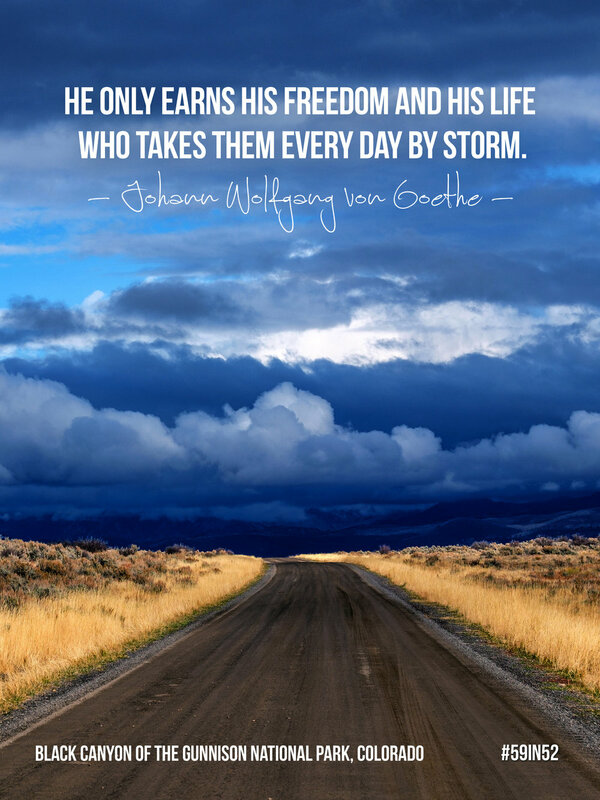 So go ahead and push yourself a bit – get near the edge – just be slow, strategic, and safe about it. Sometimes you need people in a shot to show scale. Luckily, the national parks are popular places for visitors and usually, there is no lack of people to act as your model. I usually chat people up at lookouts and viewpoints, and I have made some really great friends in the national parks, while also capturing some cool photos thanks to them. For example, I saw the horseback riders (below) preparing to take off and I asked them if they wouldn’t mind if I took their photo as they were leaving, which led to a nice conversation about horseback riding in this park. I also talked with this gentleman at another viewpoint, also pictured below, who turned out to be from Ireland – one of my favorite places (I am Irish, after all.) We had a great conversation, and he let me take his photo looking back into the canyon. Don’t be afraid to chat people up and ask them if they wouldn’t mind being in your photo – adding people can help better tell the story of a place. 9) Get up high, if you can. Varying the height of your camera is another time-tested technique used to capture interesting photos from unique vantage points. 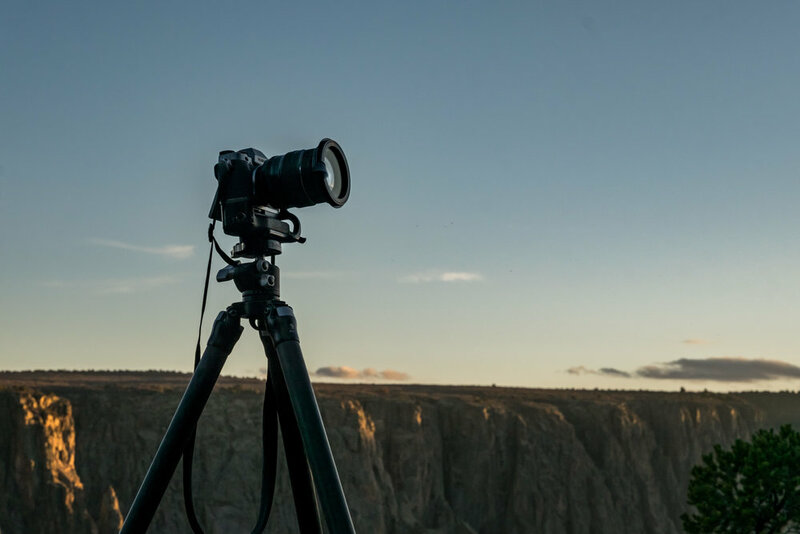 With canyon photography, this usually means stepping back and finding a higher place to climb up on to get a different angle. It’s not always possible to find higher ground beyond the top of a canyon, so in those instances I use a giant tripod. I have the Studio Assets MegaMast Carbon Fiber Camera Stand, which is a foldable tripod that raises to over 27ft! I can control my Fujifilm X-T1 Camera with my phone via wifi, which lets me get some really unique shots. 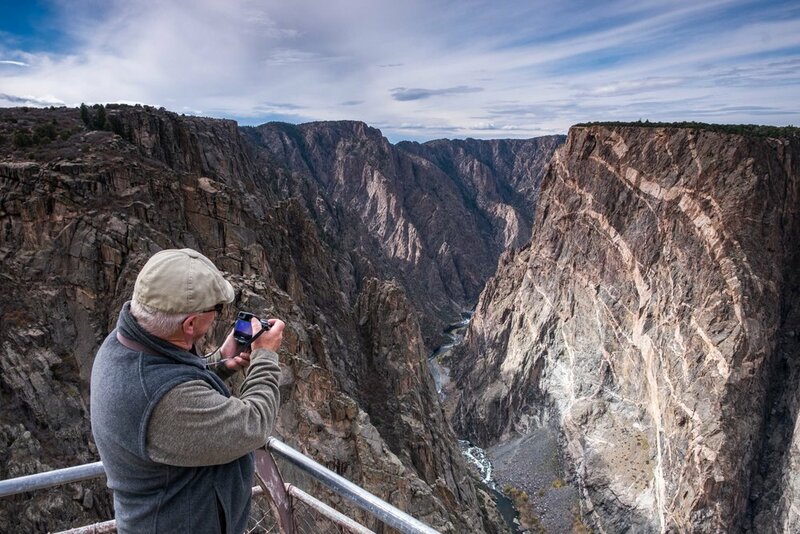 What better way to show the depths of the canyon than getting a birds-eye-view? Plus, I bet no one else has that same shot. Shot with a 27ft. tripod. 10) Blue hour is where it's at. 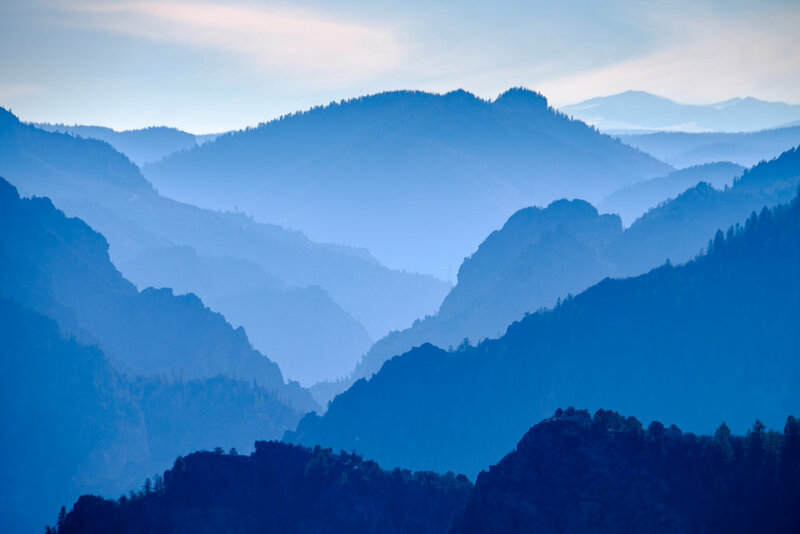 There’s a really special time in the day, called the “blue hour,” that will help you get some beautiful images of any canyon. Blue hour is essentially the time before sunrise and after sunset when the light hasn’t quite faded into night or day and the world is awash in a soft blue hue. You must act quickly, because the light changes fast at these times of the day. However, if you catch it at just the right time, you will be rewarded with a sublime photo. With high contrast scenes and difficult lighting, photographing canyons can be quite tricky. 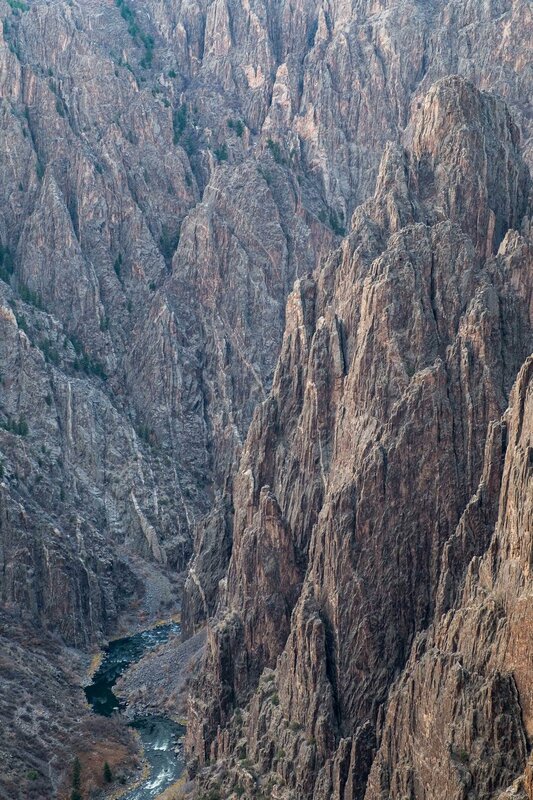 But trust me when I say that it is not impossible to get a great shot of a canyon like Black Canyon of the Gunnison NP. Follow the tips and tricks above and your images of this (and any) canyon will dramatically improve. 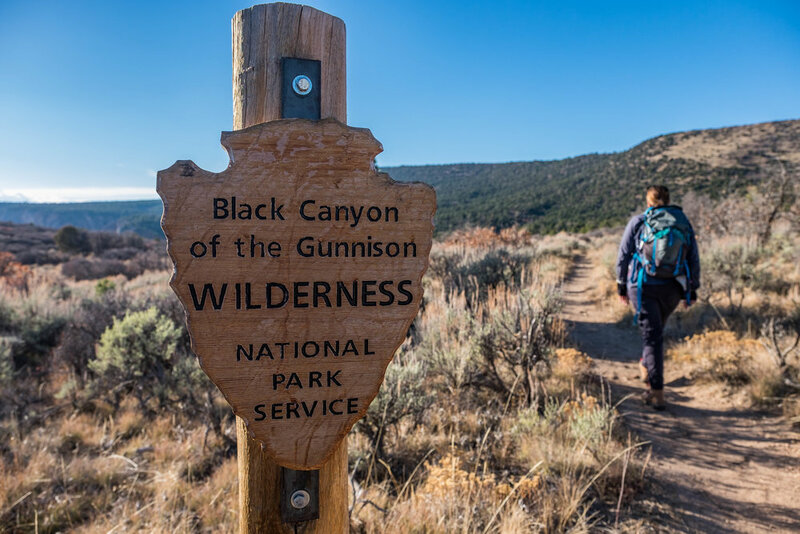 "Much rocks, big water," was how native Ute indians in the area referred to Black Canyon of the Gunnison. 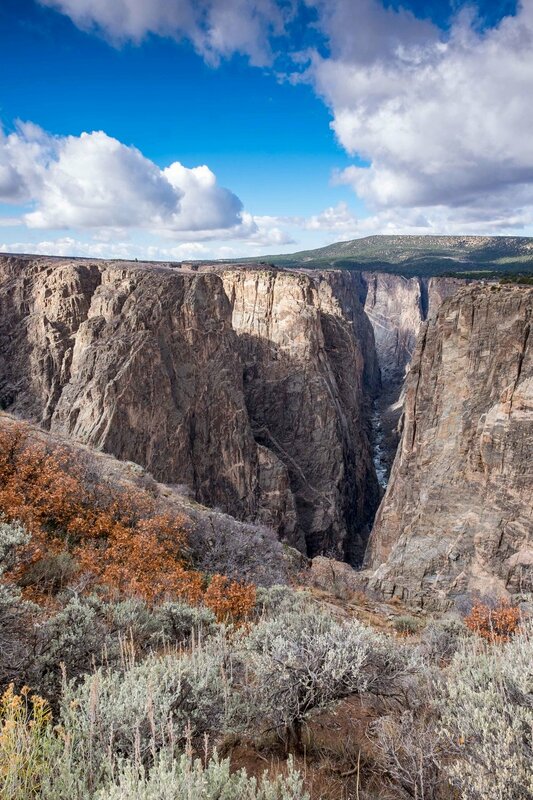 How the park got its name: This national park got its name from the Gunnison River (named after army engineer John W. Gunnison) that cuts through the canyon; and from the "black canyon" with walls so steep that it only sees about 30 minutes of sunlight each day. 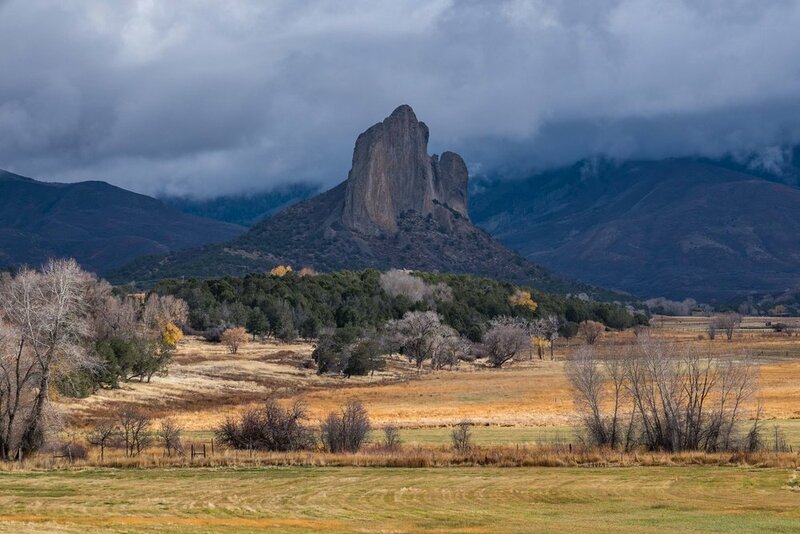 Native Ute Indians traveled the area long before written history began and before Europeans ever laid eyes on it, although they never entered its walls out of superstition... they referred to it "much rocks, big water." 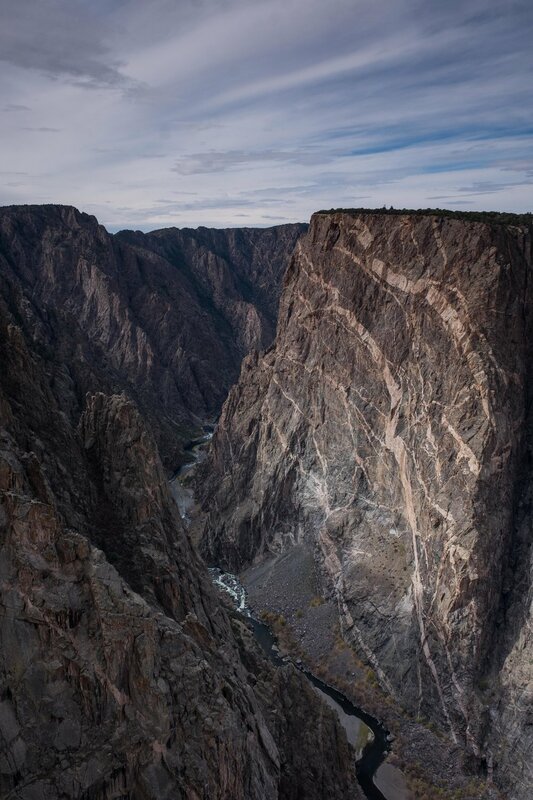 Iconic site in the park: The sheer stone walls of Black Canyon of the Gunnison plunge so sharply into the green river gorge that any one glimpse from above can easily have dizzying effects. 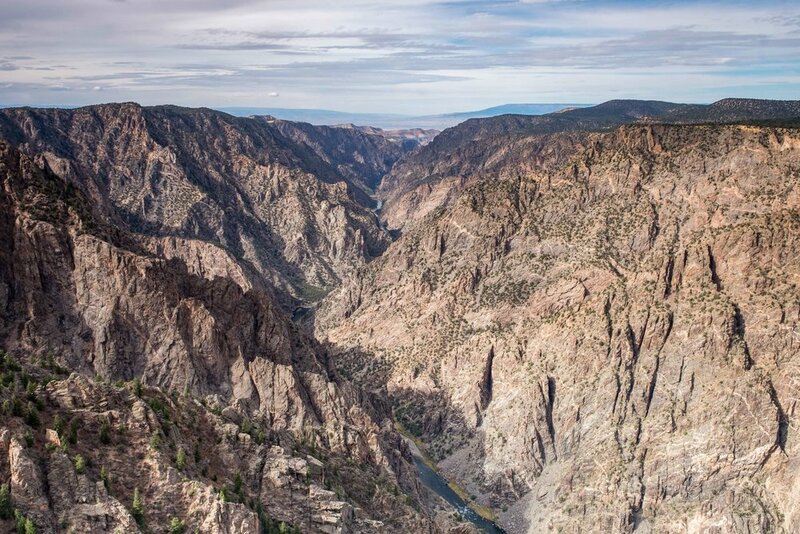 No other canyon combines the narrowness, sheerness, and depth of the Black Canyon, a result of the steep grade of the river which has an average fall of 95 feet per mile. 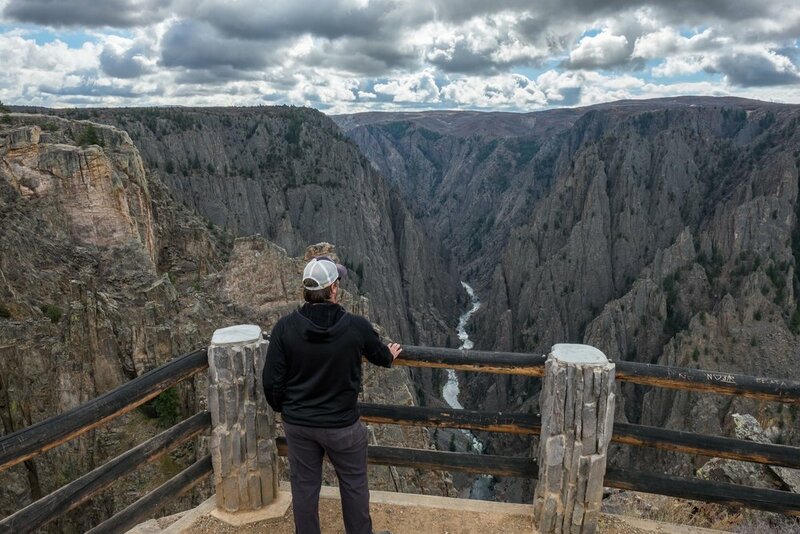 It took 2 million years for the Gunnison River to carve the vertical walls of the canyon at a rate of one inch per century—something to ponder while gazing across the dramatic canyon from any of 18 overlooks found on the North and South Rims. Our campsite nestled in the juniper-pinyon trees at the North Rim Campground. 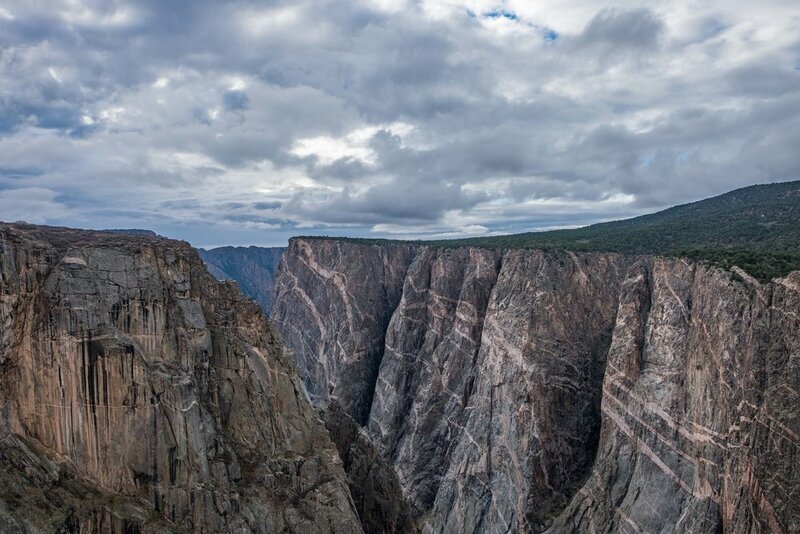 Big adventure: With 2,000-foot vertical rock walls, Black Canyon is not surprisingly a challenge that many rock climbers and technical hikers want to take on. Few of the vertical trails are climbed regularly... when you take one look at the sheer depths of the canyon you'll understand why. 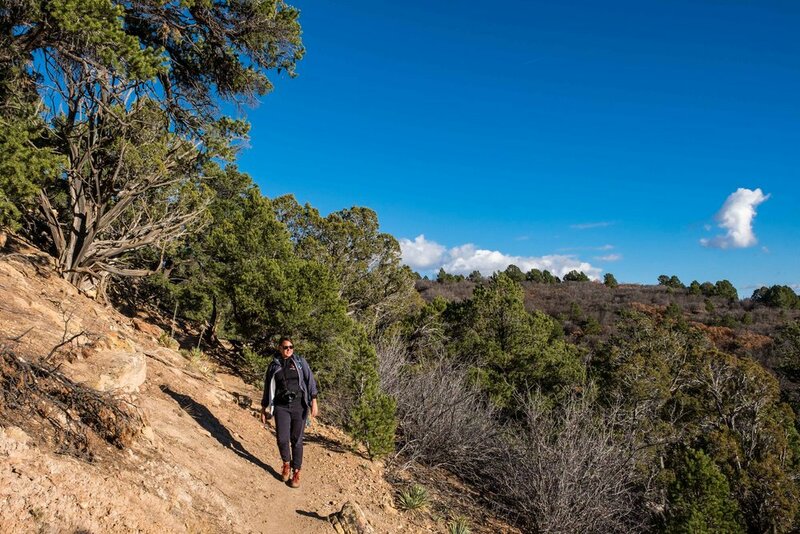 There are no maintained trails, route-finding is a must, and the brave souls who take on these monster hikes must be prepared for self-rescue as access into the canyon is difficult and expensive for rescue teams. 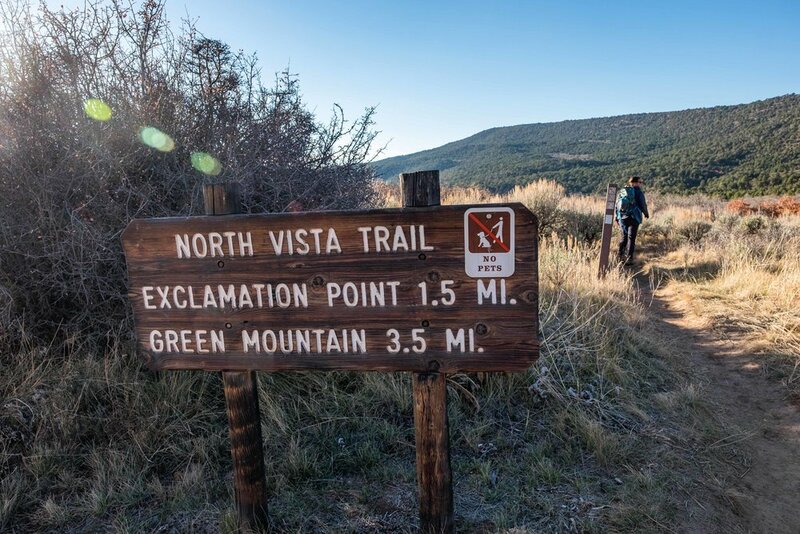 If all of that sounds fine, you'll want to check out the most popular route, the Gunnison Route, which starts at the South Rim Visitor Center and drops 1,800 feet into the canyon where you will grab ahold of a chain 1/3 way down to descend the final 80 feet. 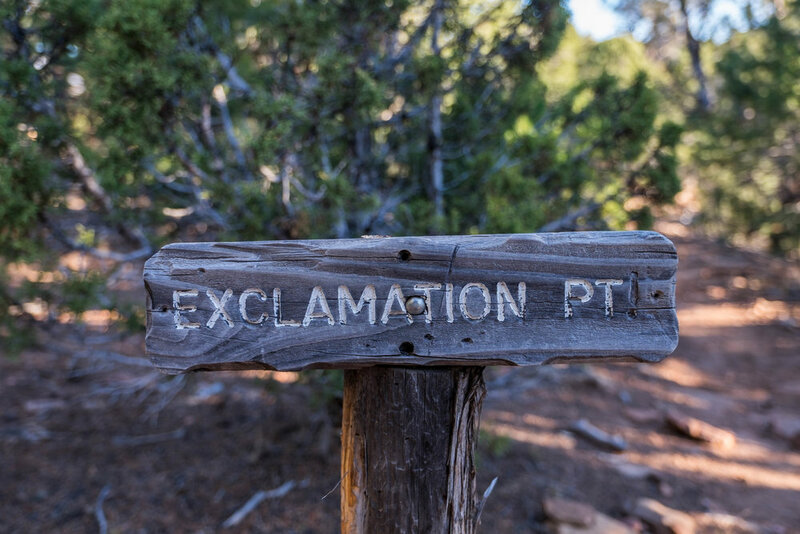 If that doesn't sound like your kind of thing, there are plenty of great hiking trails around the top of the North and South Rims for those who don't want to descend into the inner-canyon. 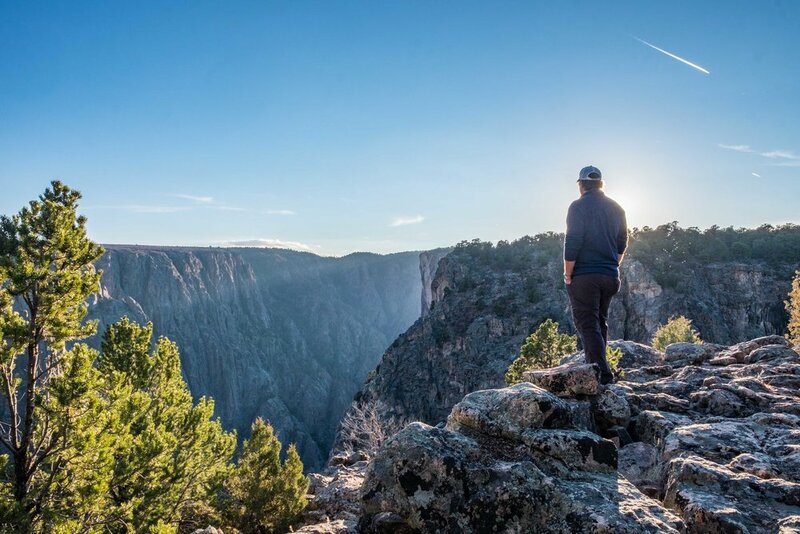 *Hiking inner canyon trails at Black Canyon is for experienced hikers/climbers only. 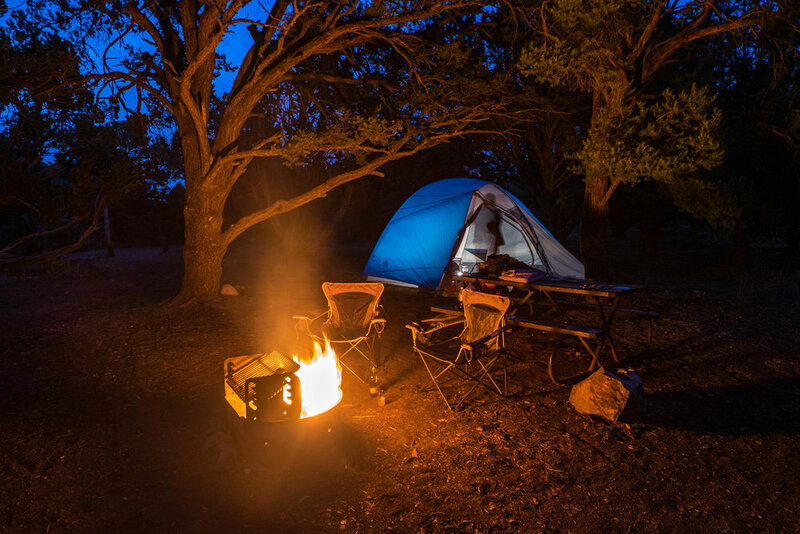 As is the case with all adventures in our national parks, your safety is your own responsibility. Don't forget to chat with the knowledgeable Park Service Rangers at the visitor centers before taking on a big adventure in our national parks! The Painted Canyon is the most photographed canyon scene in the national park. 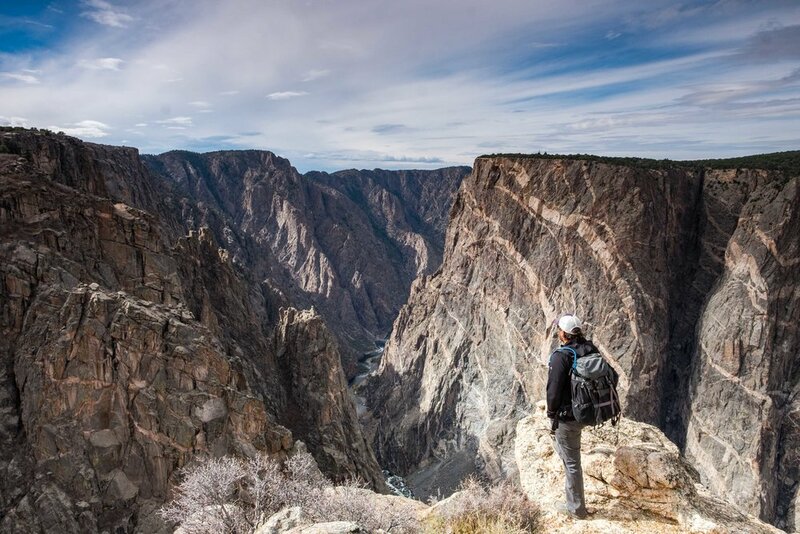 Black Canyon of the Gunnison is one of America’s least visited national parks. 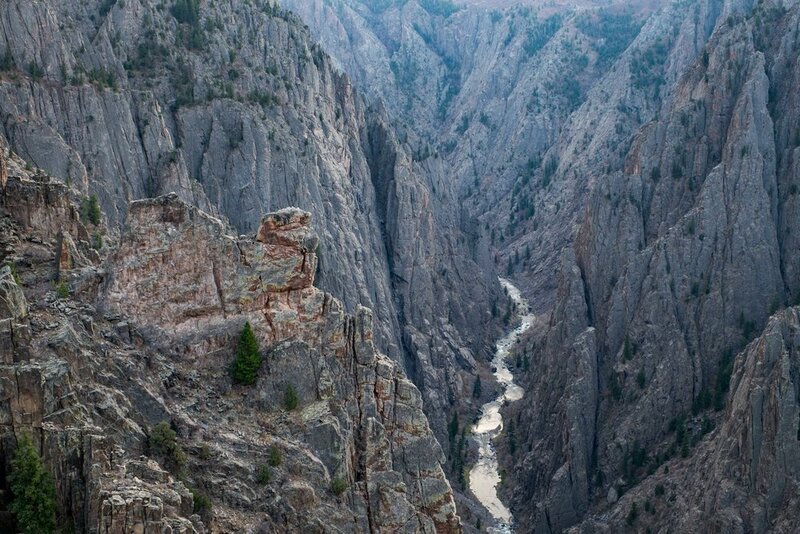 The Gunnison River carved the canyon at a rate of one inch per century. 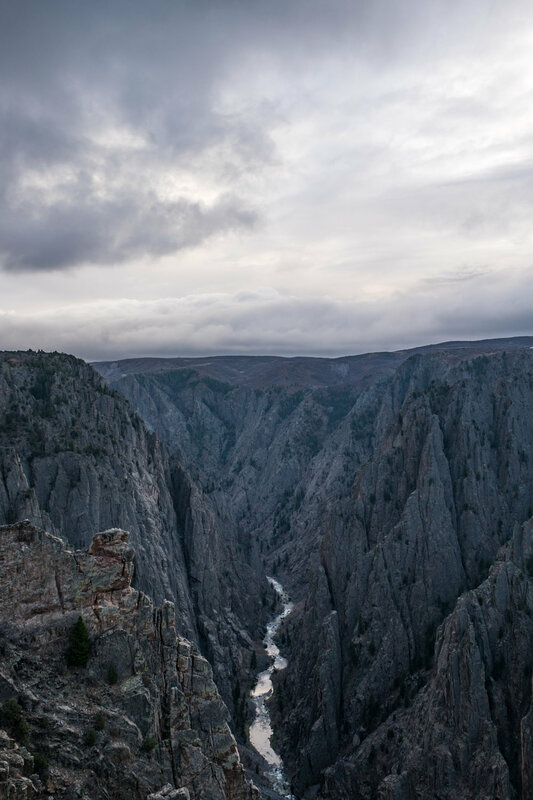 The grey stone walls of Black Canyon are made of schist and gneiss. Citing National Geographic Travel, the metamorphic rocks exposed at the bottom of the canyon are nearly two billion years old, dating from the Precambrian or oldest era of the Earth. 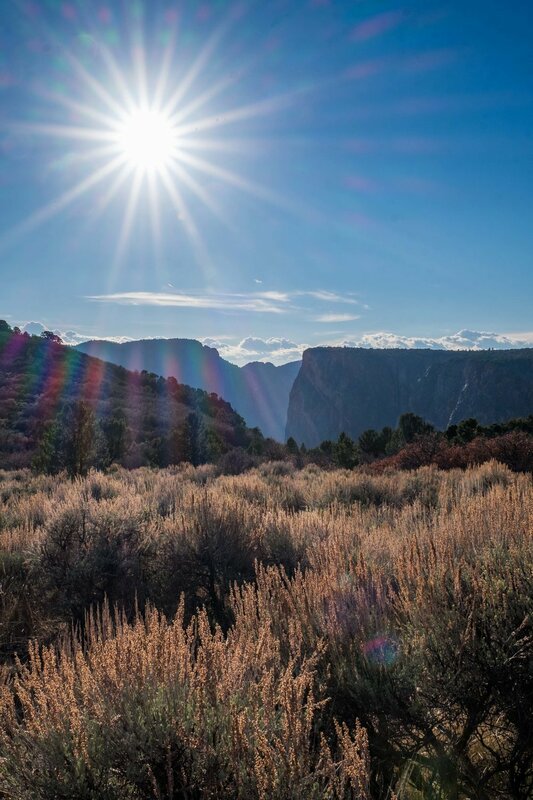 An estimated 33 minutes of sunlight penetrates the canyon each day. 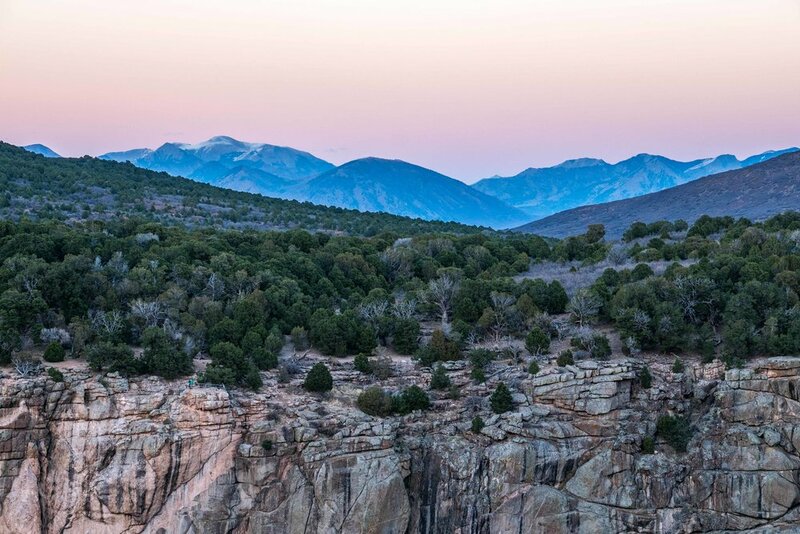 The canyon walls live at 8,000 feet above sea level. 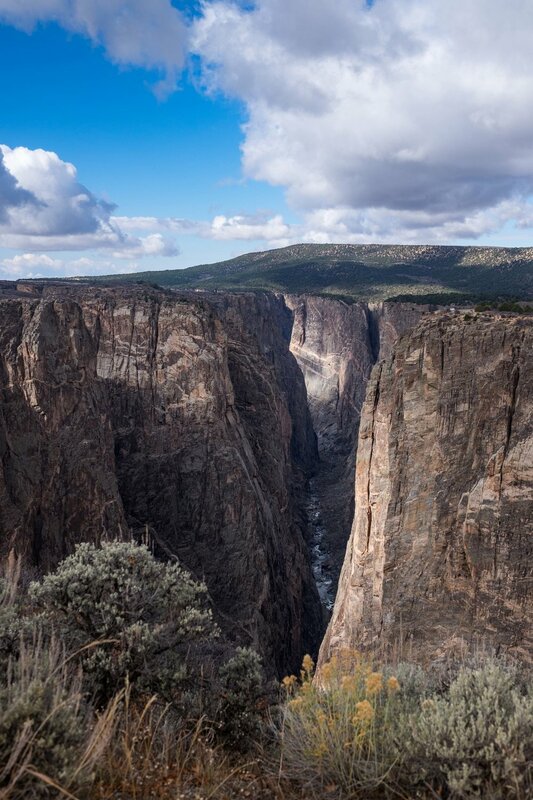 The highest wall in the park is the Painted Canyon, the highest cliff in the great state of Colorado, standing at 2,250 feet from river to rim. 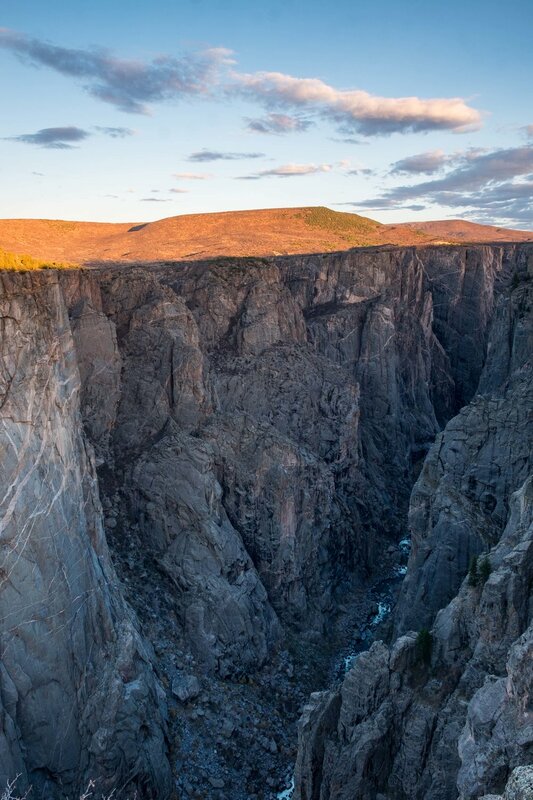 The narrowest gap between canyon walls is 40 feet. There is no bridge connecting the two sides. It’s a trek to get to the North Rim from the South Rim—about 1.5 hours driving on the west side; and 2.5-3 hours driving in from the east. The final stretch crosses seven miles of unpaved road. Bring a spare and a 4x4 if possible! North Rim Road was built in 1933-35 by the Civilian Conservation Corps under Park Service guidance. The 5-mile roadway is a designated historic district on the U.S. National Registrar of Historic Places. 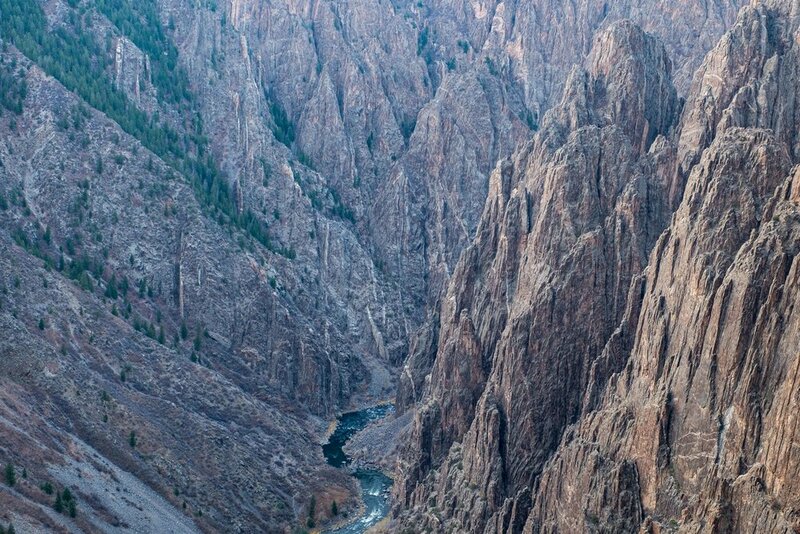 Black Canyon’s greatest depth is 2,722 feet. By comparison, the greatest depth at the Grand Canyon in Arizona is 5,280 feet; at Grand Canyon of the Yellowstone in Wyoming it is 1,200 feet deep. You are not allowed to enter the canyon without a backcountry wilderness permit unless driving in on East Portal Road, accessible from the South Rim, which takes you to the bottom of the canyon down 16% grade (very steep!) 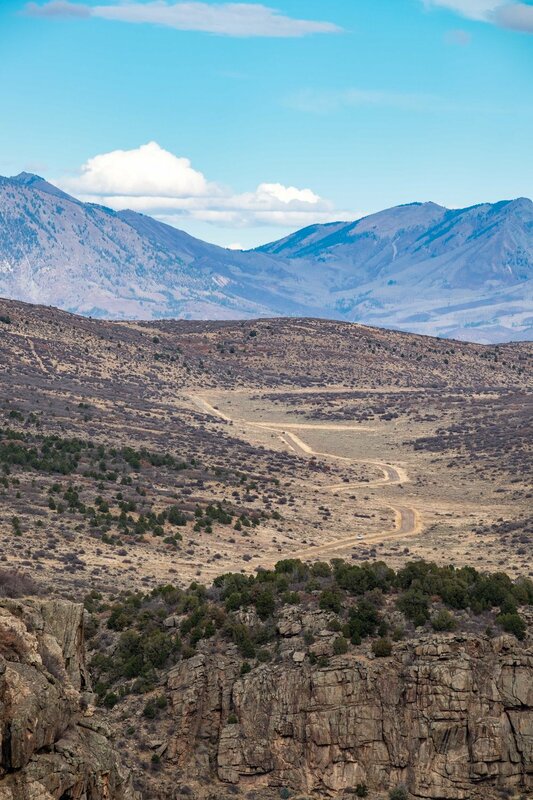 East Portal Road provides access to fishing and camping areas in the Curecanti National Recreation Area, also operated by the U.S. National Park Service. East Portal Road provides the only access to the inner canyon down steep grades. Wally the Airstream couldn't make the trek but he was there in spirit! 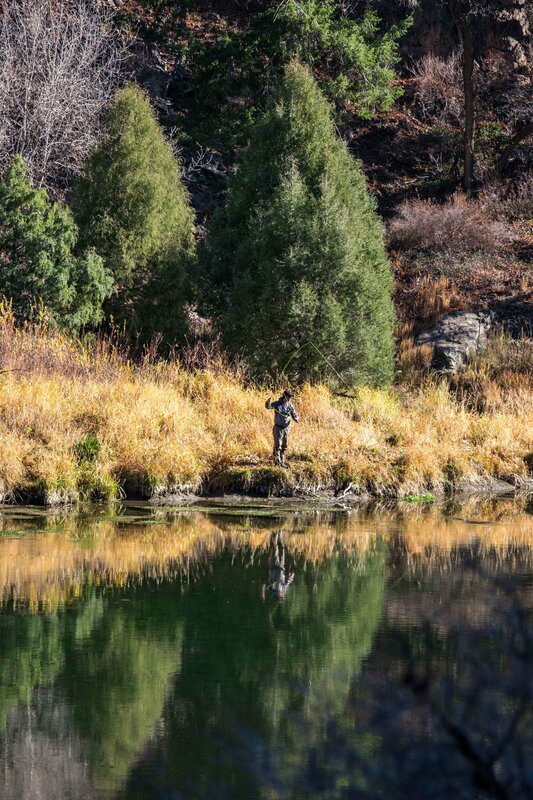 An angler drops a line into the Gunnison River at the bottom of the canyon in the Curecanti National Recreation Area, also managed by the U.S. National Park Service. Poison ivy is notoriously impossible to avoid while hiking the inner canyon and is overgrown along the river. 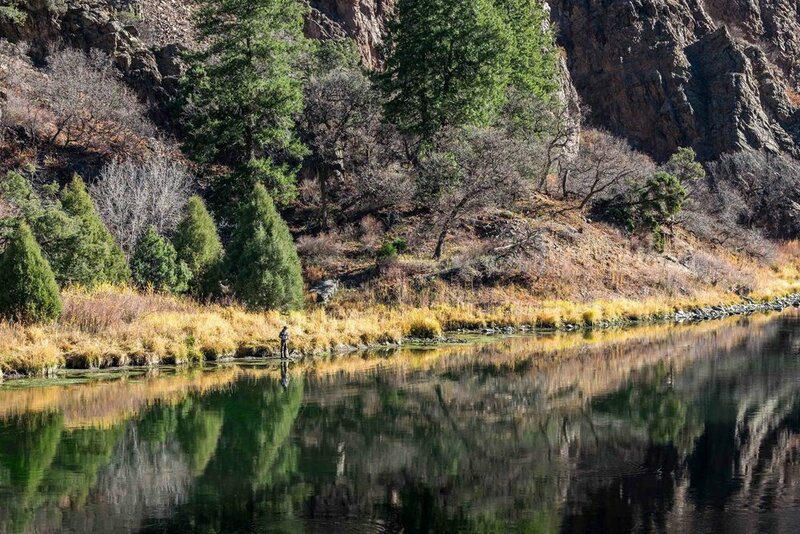 The Gunnison River connects with the Colorado River about 75 miles downstream from the area of the gorge that is protected in the park. 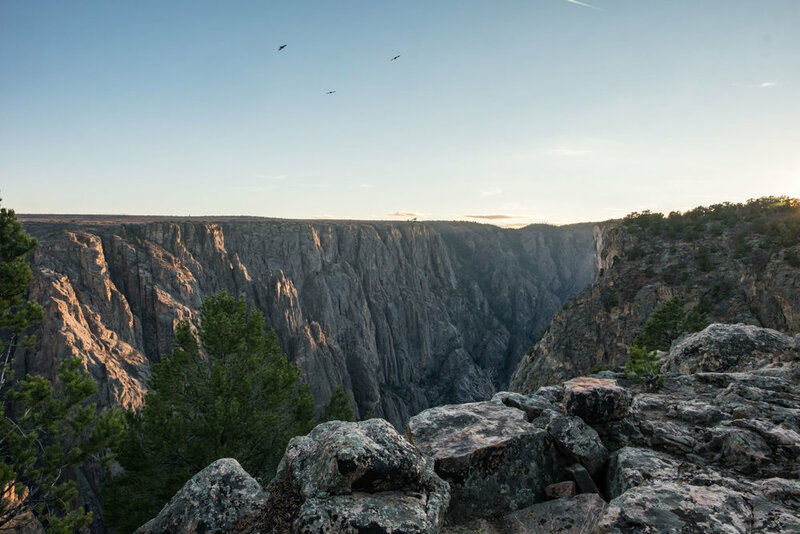 Incredible bird life can be seen soaring high above the canyon walls, including peregrine falcons, ravens, and golden eagles. Mule deer spotted on South Rim Road. Other wildlife includes black bear, elk, mule deer, coyote, rabbit, bobcats, mountain cottontails, red fox, rock squirrels, Rocky Mountain bighorn sheep, and mountain lions (which we finally saw in the wild this year while driving South Rim Road!) Drive carefully at night to help protect our wild friends, everywhere, and especially in this park! The majority of the Gunnison River is class III-V rapids and some portions of it are unrunnable, even for the most experienced kayakers and rafters. 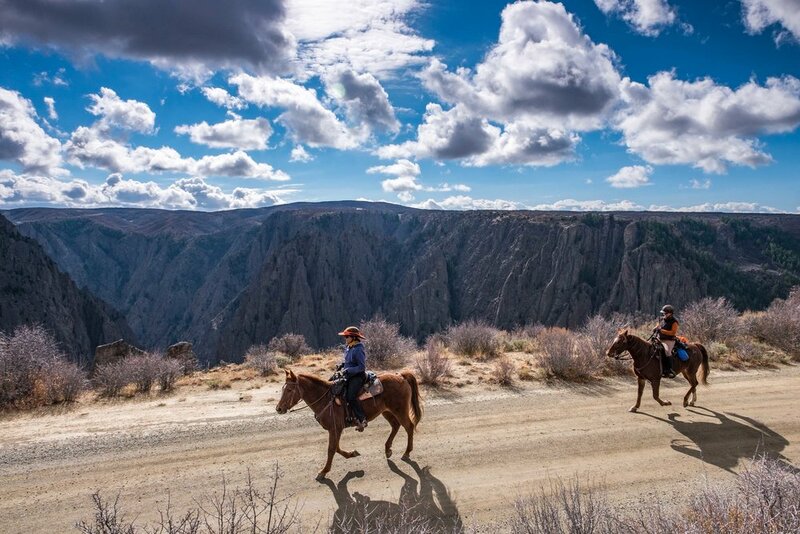 There is one horseback riding trail in the park, Deadhorse Trail located on North Rim Road. Want to get on the water without the risk? 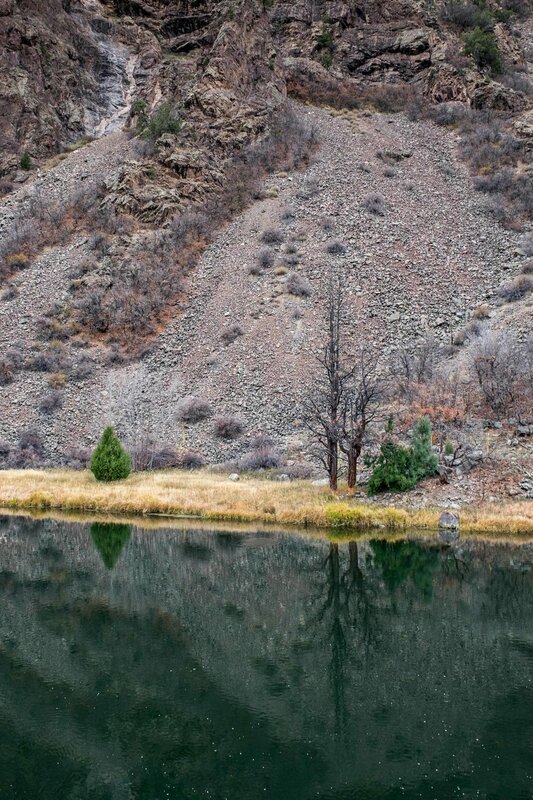 The Curecanti National Recreation Area offers 90 minute boat tours on the Gunnison River where you can learn about the awesome geology, ecology, and history of the park. 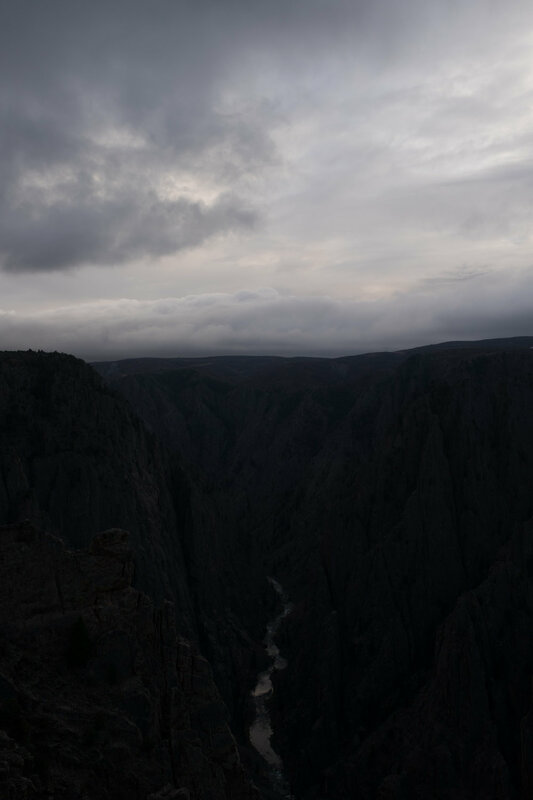 Black Canyon of the Gunnison National Park is a designated International Dark Sky Park and offers summer stargazing programs annually. You will see plenty of hunters during hunting season on the border of the park boundaries... animals know no boundaries to the benefit of the hunter. 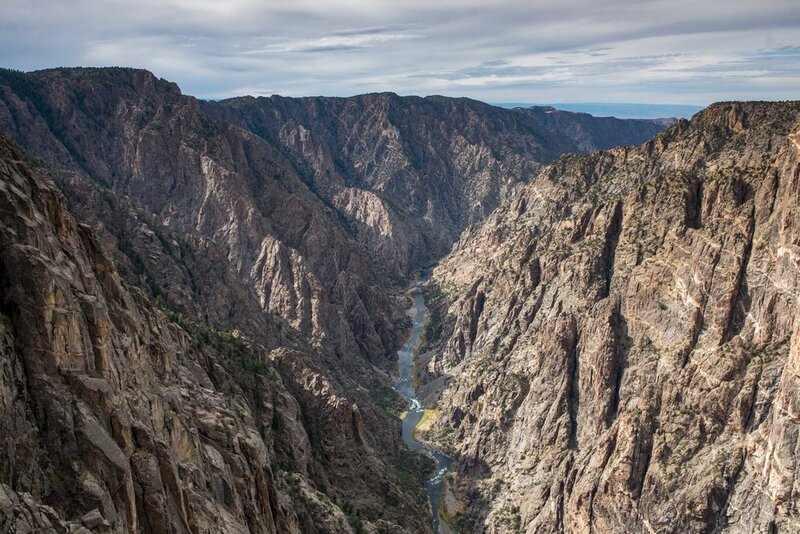 Portions of the epic film True Grit were filmed in Black Canyon. Also filmed there: the Unsinkable Molly Brown (1964). 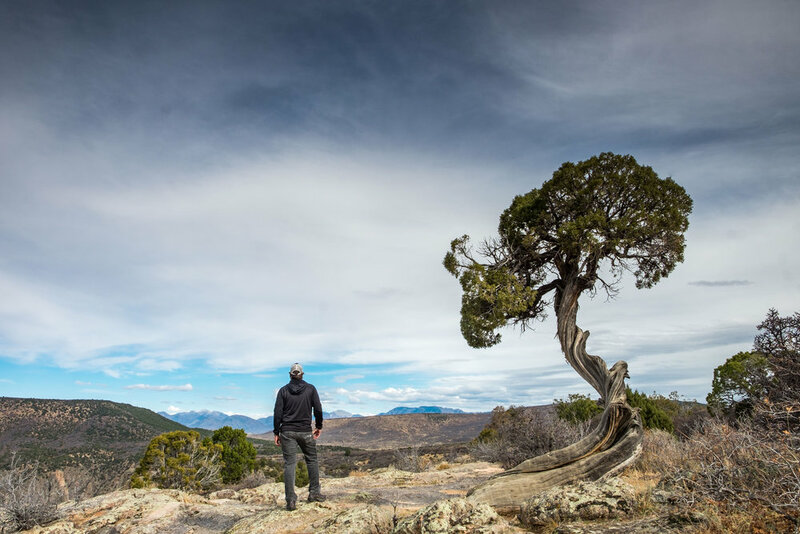 Our good friends at Travel Colorado (the official state tourism board) have really great write-ups for several awesome adventures located in close proximity of the national park. 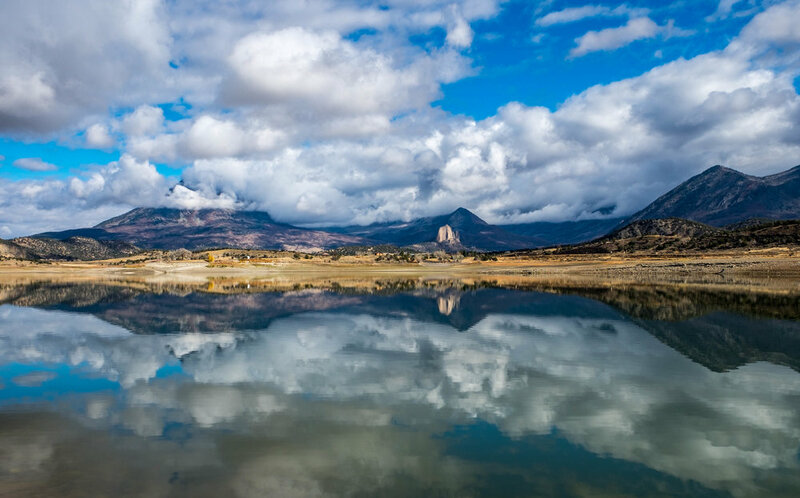 Check out the Ute Indian Museum, Curecanti National Recreational Area, Blue Mesa Reservoir, Montrose Historical Museum, Museum of the Mountain West when heading to the wild western region of Colorado. 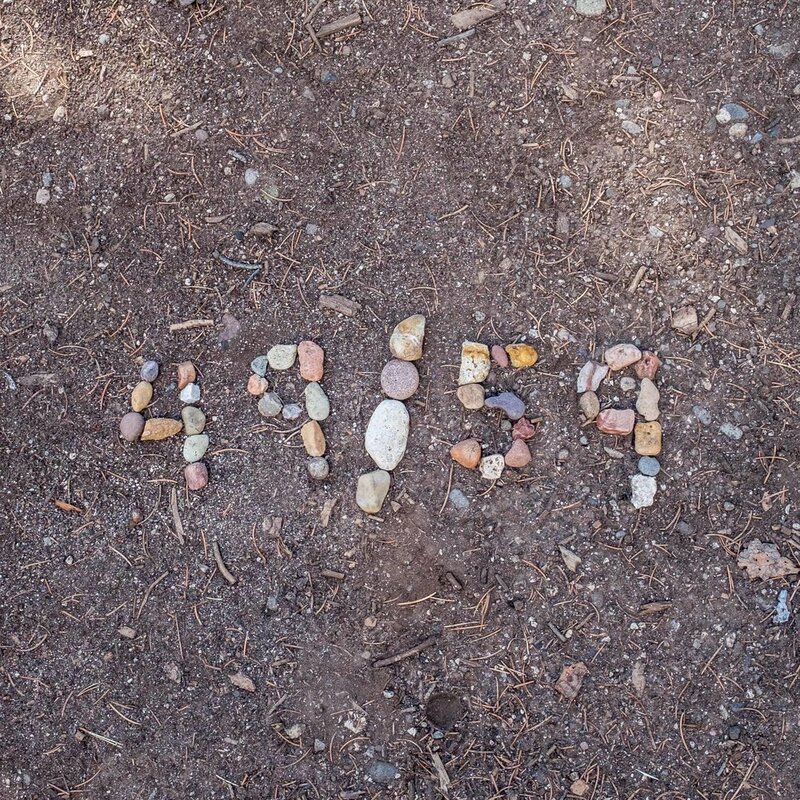 There were 2,592 visitors recorded in the park in 1934 (the year after it was established as a national monument,) and 238,018 in 2016 during the National Park Service Centennial Year. 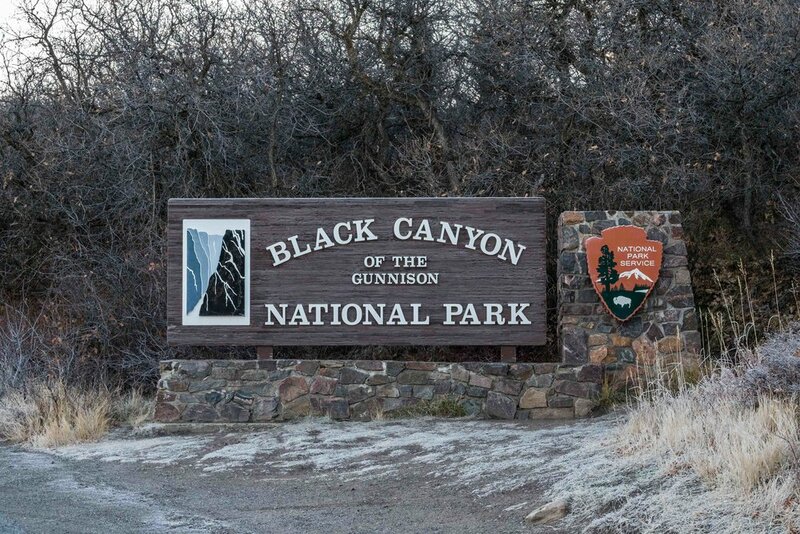 The park entrance sign to Black Canyon of the Gunnison National Park in Colorado.